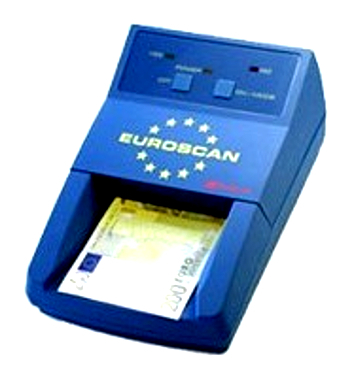 The Euroscan 77 counterfeit detector, made by Cashscan, is an extremely affordable currency verification unit capable of verifying the Euro and US Dollar with great accuracy. The Euroscan 77 performs multiple tests to verify currency including checking magnetic level of the ink, verifying authenticity of embedded security thread, and verifying the presence of infra-red ink, invisible to the human eye, printed on the note. The Euroscan 77 comes with EU-approved power supply requiring minimal maintenance for years of uninterrupted verification. It is easily upgradable for future currency releases. Comes with 1 year parts and labor warranty. In its default setup, verifies the Euro and US Dollar. Can also be ordered to verify Euro and any secondary currency from Cashscan library of over 70 world currencies. Operates on 220V adapter (included). Dimensions: 8 1/2 inches x 5 1/2 inches x 4 inches. Weight: 3 1/2 lbs. Euroscan 77 counterfeit detector, made by Cashscan, very affordable. Very affordable, accurate and needs minimal maintenance. In its default setup, verifies the Euro and US Dollar. Can also be ordered to verify Euro and any secondary currency from Cashscan library of over 70 world currencies.